Foreign Trust Protection for Foreign Assets | TaxConnections is a where to find leading tax experts and tax resources worldwide. If you have believed this to be true and set up a trust in a foreign country or are thinking of taking this step or are just plain curious about foreign trusts, then you need to read this blog post. U.S.owners and beneficiaries of foreign trusts have complex U.S. reporting requirements, which are different from the reporting requirements imposed on U.S. domestic trusts. Please Note: All references to “U.S. owners” and “U.S. beneficiaries” refer to persons who are considered U.S. residents for income tax purposes; i.e., either a U.S. citizen, a green card holder, or someone who meets the “substantial presence test” in any tax year. The U.S. taxation of the income and distributions from a foreign trust depends on the type of foreign trust and the status of the trust’s beneficiaries at the time of distribution. How is the Tax Residence of the trust determined? If your trust fails the “Court Test” and the “Control Test”, then it is considered a foreign trust as per § 301.7701-7 (a) (2). • A “Court Test” is fulfilled when “any federal, state, or local court within the United States is able to exercise primary authority over substantially all of the administration of the trust (the authority under local law to render orders or judgments)”. There are also bright-lines rules and safe harbor rules for fulfilling the “Court Test”. • A “Control Test” is fulfilled when “one or more U.S. persons have the authority, by vote or otherwise, to make all “substantial decisions” of the trust with no other person having veto power (except for the grantor or beneficiary acting in a fiduciary capacity)”. • The trust will automatically fail these two tests if the trust instrument provides words to the effect that will cause it fail the 2 tests. The “grantor” is the person who creates the trust, and the beneficiaries are the persons identified in the trust to receive the assets. The “trustee” is a person who manages the trust for the benefit of someone else, namely, a “beneficiary”. The US income taxation of a foreign trust depends on whether the trust is a grantor or nongrantor trust. 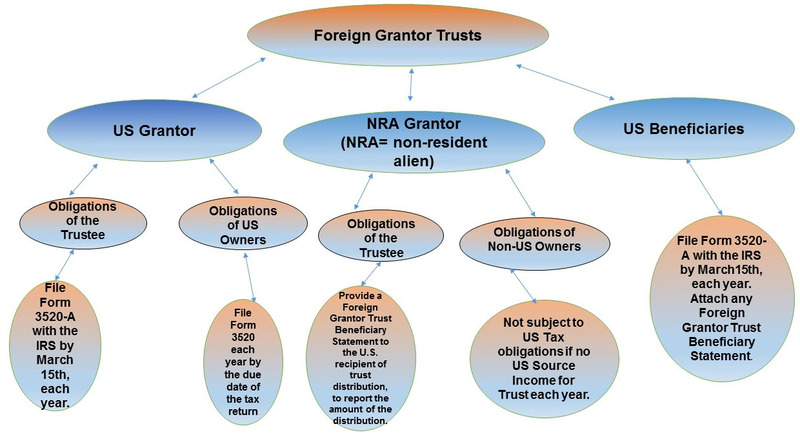 Income from a foreign grantor trust is generally taxed to the trust’s grantor, rather than to the trust itself or to the trust’s beneficiaries. On the contrary, income from a foreign nongrantor trust is generally taxed when distributed to US beneficiaries, except to the extent US source or effectively connected income is earned and retained by the trust, in which case the nongrantor trust would pay US income tax for the year such income is earned. 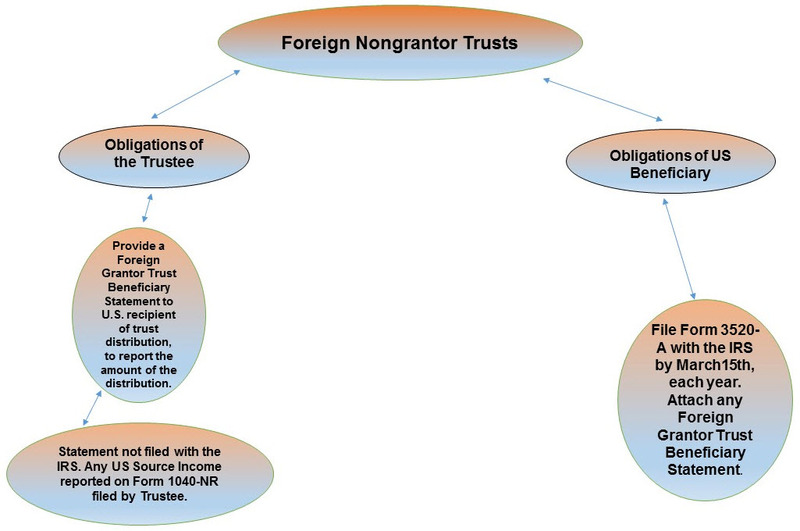 The following flow charts explain the tax compliance obligations of the trustees & US beneficiaries of the foreign grantor & nongrantor trusts. They only provide a broad overview of the obligations of the trustees, US owners and beneficiaries. There will also be reporting & tax obligations if a beneficiary uses property owned by a foreign trust, since the use itself is considered a “distribution”. The disclosure requirements under § 6038D also apply to foreign trusts and so also the requirements to file the FinCEN Form 114. So going back to the urban legend we started with, please consult an Enrolled Agent, CPA or Tax Attorney well-versed in foreign trusts if you are a beneficiary/ trustee of a foreign trust or are thinking of setting up a trust in a foreign country. Bibliography: www.irs.gov; §301.7701-7; Form 3520; Form 3520-A; § 6308D; Abusive Offshore Tax Avoidance Schemes from the IRS. Hey there, Manasa ! Appreciate very much your professional time & effort to explain foreign tax matters as they relate to individuals required to file US income tax returns. Your in-depth tax research with substantial tax authority references as well as clear & concise explanations are to be commended – so I salute you, Manasa ! Just a few inquiries for further explanations from your extensive knowledge, experience, & expertise. (1) Are there any specialized Foreign Income Tax Credit reporting requirements that involved at the trust entity level or at the beneficiary level ? For example, does any “accrued” foreign tax liability (fiscal or calendar year) require supplemental info as to when those assessed foreign taxes were actually paid ? (2) What about classification of foreign trust when tax reporting is required – (A) Simple Trust vs (B) Complex Trust vs (C) Estate ? (3) Since US individuals that are trust beneficiaries get taxed on world wide taxable income, do specific tax treaties address taxation matters regarding foreign trusts ? (4) Will there be reporting “timing” differences where foreign trusts provide tax return info for a fiscal year that must be reported in correct US calendar year ? (5) Do bank accounts for “grantor” foreign trusts get included as financial bank accounts for FinCEN114 as well as FBAR reporting assuming relevant reporting threshold amounts have been exceeded for both ? (6) How does a US tax preparer obtain the necessary tax reporting information required as far as establishing relationship with trust foreign custodial entity – will IRS form 8121 “tax Information Authorization” along with IRS form 2848 “Power of Attorney” be respected as legitimate by the foreign custodian of either “grantor” or “nongreantor” foreign trust. Thanks for your extra time & effort into these matters – keep up the great work ! Hello James Kronenberg, I have sent you an email with detailed answers for your questions. Thanks for your kind words!